This morning, we released a new report (download PDF here) on the sources of state and local revenue. Property taxes make up the largest portion of combined state and local government tax revenue at 35%, with sales and gross receipts taxes close behind at 34%. The corporate income tax brings in the smallest amount of any major tax, providing only about 3% of the tax revenues taken in by state and local tax collectors. The composition of all state and local revenue has also shifted significantly over time. A century ago, property taxes provided over 80% of all state and local government tax revenues, while in recent decades that proportion has fallen to around a third of total tax receipts. The corporate income tax rose from nonexistent in 1913 to raising 6% of state and local tax revenue in 1980, only to fall back to 3.4% in fiscal year 2010. 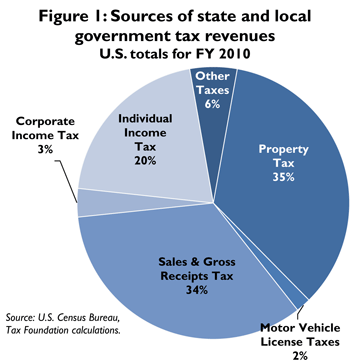 The data, taken from U.S. Census figures for 2010, looks just at state and local tax revenue ($1.269 trillion). It does not include $608 billion in non-tax revenues (interest and user fees including tolls and tuition), $623 billion in federal aid, and $669 billion in enterprise revenues (primarily pension funds but also liquor store revenue). A future report will cover these topics. ​Tax Foundation Fiscal Fact No. 354, “The Sources of State and Local Tax Revenues” by Elizabeth Malm and Ellen Kant is available online.